Forget about the classic branded pens (although BRAVA Marketing loves those, too), pencils, or business cards (they’re still essential). Here’s the one thing many brands need to keep in mind if paying for a booth to reach a massive influx of people at a convention or a trade show: branded stress relievers. That’s right. Confused, yet? We’ll explain. For one, you’re giving away an awesome gift that has your brand name on it. That’s numero uno, obviously. Just about any gift you give at a convention should have your brand name on it. Secondly, ask yourself this important question — are participants pretty calm and clear at conventions? Hardly. Trade shows are big business. You go to them to learn. But they can be so hectic, what with the alarming number of people constantly in and out of the halls, constantly on the phone or doing Facebook Lives, taking notes and learning as much as they can for the day 1, day 2, or day 3 that they’re there. Needless to say, many participants attending such conventions and trade shows need a nice reminder to slow down. 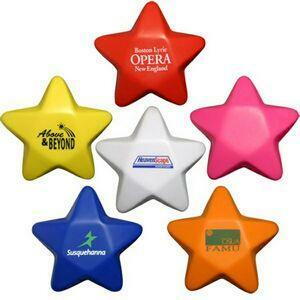 Why not hand over some great branded stress relievers as a way to not only give them something to focus on with their hands while collecting upteen-million business cards and pamphlets, but to also smile at the cuteness? Like we said — it kills two birds with one stone. This is keeping in mind that just one conversation with one participant about your brand may lead to a partnership worth literally thousands of dollars. Think about it. Why do you spend hundreds to get a booth anyway? To make contacts. Go the extra mile, peruse our designs, and then contact us immediately. We can get you squared away with your first order right now. Now move on to the next booth, why don’t you? The clock’s ticking, man.